Calcium and other minerals can build up on your water ionizer plates. This build up causes your water ionizer to provide less than optimal performance. All water ionizers require regular maintenance, and cleaning the ionizer plates via a citric acid flush is one of the best ways to ensure optimum performance. Hard water areas require more frequent citric acid flushing, since minerals build occurs more rapidly. If water in your area is “hard” meaning that it has lots of minerals, you may need to do a cleaning more frequently. We recommend that ionizer owners in hard water areas do a citric acid flush at least every 3 months and ionizer owners in soft water areas at least once every year.View Map of Water Hardness in the US. The citric acid flush is a fairly simple procedure that you can do yourself by purchasing citric acid powder ($12) and following the directions listed below for your particular ionizer. Or if you prefer to let us handle it, you may send in your machine to be serviced for $59 plus shipping costs. Directions for how to send your machine in for service can be found here. 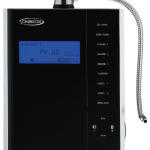 What type of Water Ionizer do you have?